As the years go by, I have less and less interest in thrash metal. These days, I’m a rocker and I love the ever so broad genre of “heavy metal”, but once you start cutting it down into some of the heavier heavy metal genres, I tend to lose interest quickly outside of the usual big names like Metallica, Megadeth and Anthrax. Pop metal/hair metal/glam metal/whatever you want to call it was always my first love, so it’s not like I’ve ever been a HUGE fan of the thrash genre in the first place. But… I recent times, I’m making a conscious effort to discover some of the more metallic bands out there. Actually, I “discovered” Testament years ago by purchasing The Very Best of Testament compilation. I liked it well enough, but it never made me feel like searching out their albums, even if my original intent was to use it as a “sampler” and gateway to their albums. 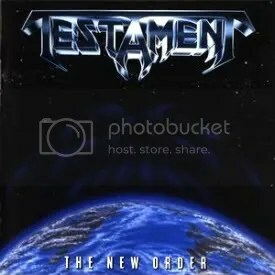 Well, given all the praise 2008’s The Formation of Damnation has received, I decided to give the band another look, and most frequently, The New Order was the recommended album for a Testament newbie such as myself. It’s not hard to see why, the band does a better job of bringing melody to thrash metal than most other thrash bands. The instrumentals “Hypnosis” (as short as it is) and “Musical Death (A Dirge)” and the intros to “Eerie Inhabitants” and “Disciples of the Watch” show the band can do much more than just pound away on their instruments and scream. The band also scores extra points with me for doing a metalized version of Aerosmith’s “Nobody’s Fault”, which I think is exceptional. I can’t help but think of Ratt when I hear it though because Chuck Billy sounds a lot like Stephen Pearcy on this song. Consider me converted and their melodic style of thrash metal.